Man darf gespannt sein, wie hoch das Eis jetzt schießen wird. Bereits letzten Sommer mussten Nordpolarmeerfahrer ihre Expeditionen abbrechen, da sie nicht durch das dichte Sommereis kamen. Wenn man sich die blaue Meereiskurve der Arktis in der Abbildung oben anschaut, so ist der Rückgang des Eises in den letzten 35 Jahren deutlich zu erkennen. Ist das alles eine Folge der Klimaerwärmung? Oder könnte da auch ein Stück Zyklik drinstecken, natürliche Klimavariabilität. Zugegeben, die 35 Jahre entsprechen gerade mal einem halben Ozeanzkylus, der üblicherweise sechs Jahrzehnte umfasst. In addition to seasonal forecasts on time scales of a few months, also forecasts on time scales of a few years have made some headlines over the past decade. These headlines were usually related to claims that the Arctic would lose its remaining summer sea ice within just a few years. The underlying reasoning of such claims was often related to a discussion of a possible ’tipping point’ that is related to the ice-albedo feedback. Given the substantial loss of Arctic sea ice in the past few years, the ocean could potentially absorb enough heat to rapidly melt the remainder of the sea ice cover. However, our current understanding of the Arctic climate system strongly suggests that this reasoning is unrealistic. 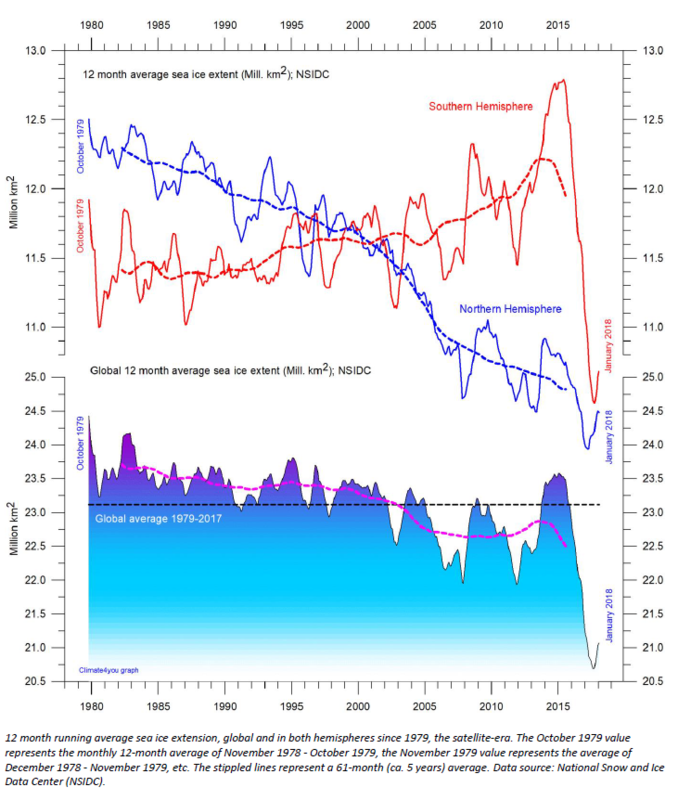 A first indication for this finding derived from model experiments in which all Arctic sea ice was synthetically removed from the Arctic Ocean at the onset of summer, thus maximising the possible ice-albedo feedback (Tietsche et al., 2011). Despite such maximised feedback, the ice cover recovered in these experiments within just a few years. This is because on annual time scales, negative feedbacks dominate the evolution of the Arctic sea ice cover. Eine solche rapide Erholung der Meereises erleben wir möglicherweise derzeit, obwohl die aktuellen Werte im Februar 2018 wieder ziemlich abgesackt sind. Steigt der Wasserspiegel durch schmelzendes Meereis? Die Dichte des Eises ist höher als die des Wassers. Es ist also schwerer als das gleiche Volumen Wasser. So sinkt es auf den Ozeanboden. Schmilzt es, vergrößert sich sein Volumen und der Meeresspiegel steigt. Die Dichte des Eises ist gleich der des Wassers. Es ist also so schwer wie das gleiche Volumen Wasser. Dann schwebt es im Wasser. Schmilzt es, verändert sich der Meeresspiegel nicht. Die Dichte des Eises ist geringer als die des Wassers. Es ist also leichter als das gleiche Volumen Wasser. Dann schwimmt es auf dem Wasser. Schmilzt es, verringert sich sein Volumen und der Meeresspiegel sollte sinken. Nun verdrängt das Eis aber nur das Volumen Wasser, das seinem Gewicht entspricht. Es ragt also aus dem Wasser heraus. Deshalb verändert sich der Meeresspiegel nicht. Das kann jeder nachprüfen, indem er einen Eiswürfel in einem Trinkglas schmelzen läßt. Von den drei Möglichkeiten entspricht glücklicherweise nur die dritte der Wirklichkeit. Wie die meisten von Ihnen bereits wissen: Es gibt keinen nennenswerten Meeresspiegelanstieg durch schmelzendes Meereis. Leider hat der Besitzer der Webseite offenbar gewechselt (nun finden sich dort englische Texte), daher hilft der Blick in die Versionen der Wayback-Maschine. The melting of sea ice will significantly increase Arctic precipitation, creating a climate feedback comparable to doubling global carbon dioxide, a Dartmouth College-led study finds. “The increases of precipitation and changes in the energy balance may create significant uncertainty in climate predictions,” says lead author Ben Kopec, a PhD candidate in Dartmouth’s Department of Earth Sciences. The findings appear in the journal Proceedings of the National Academy of Sciences. A PDF is available on request. Global climate is influenced by the Arctic water cycle, which is partly regulated by sea ice through its control on evaporation and precipitation. There is a growing consensus among scientists that a decrease in sea ice would increase Arctic precipitation because of increased evaporation. Direct measurement of precipitation is difficult in the Arctic because of its cold, windy environments, so the quantitative link between precipitation and sea ice is poorly understood. In its study, the Dartmouth-led team quantified that link by measuring the hydrogen and oxygen isotopic compositions of precipitation from 1990 to 2012 at six sites across the Arctic. They then used these empirically established sensitivities of precipitation isotopes to sea ice change to project future precipitation changes and to evaluate impacts of these changes on the energy balance. Their approach is based on the premise that Arctic precipitation is composed mostly of water from two marine evaporation regions, or “moisture sources” – one subtropical and one local – and that the relative contributions of the two sources to the precipitation can be determined from the stable isotopic ratios of the precipitation. They found that for a sea ice extent decrease of 100,000 km2 – or 38,610 square miles — the percentage of Arctic sourced moisture increases by 18.2 percent and 10.8 percent, respectively, in the Canadian Arctic and Greenland Sea regions. This corresponds to increases of 10.9 percent and 2.7 percent per degree Celsius of Arctic warming, respectively. The researchers reached no conclusion on whether the increased precipitation will fall as snow or rain. If it falls as snow, it could potentially increase glacial mass and the number of days of high land surface reflectivity, thus having a cooling effect. But if the increased precipitation falls as rain, it would cause earlier spring melt and/or later onset of autumn snow coverage, a longer low reflectivity period and additional warming. In either case, the resulting radiative forcing likely has an order of magnitude similar to that of the forcing from doubling carbon dioxide, thus demonstrating that the sea ice feedback to radiation balance through the Arctic water cycle is potentially a major component of climate change. “Sea ice is declining at an alarming rate, so it is important to understand the consequences of the climate feedbacks caused by these changes,” Kopec says. “We show that the loss of sea ice will likely increase precipitation, which will impact communities and ecosystems around the Arctic. The change of precipitation, depending on the seasonal distribution, may impact the energy balance on the same order of magnitude as the feedbacks associated with doubling carbon dioxide.” The study was supported by the National Science Foundation for the iisPACS (Isotopic Investigation of Sea ice and Precipitation in the Arctic Climate System) and for Dartmouth’s IGERT (Integrative Graduate Education and Research Traineeship) project for Polar Environmental Change. We examine the seasonal cycle of Arctic sea ice in scenarios with limited future global warming. To do so, we analyze two sets of observational records that cover the observational uncertainty of Arctic sea ice loss per degree of global warming. The observations are combined with 100 simulations of historical and future climate evolution from the Max Planck Institute Earth System Model Grand Ensemble. Based on the high-sensitivity observations, we find that Arctic September sea ice is lost with low probability (P≈ 10%) for global warming of +1.5°C above preindustrial levels and with very high probability (P> 99%) for global warming of +2°C above preindustrial levels. For the low-sensitivity observations, September sea ice is extremely unlikely to disappear for +1.5°C warming (P≪ 1%) and has low likelihood (P≈ 10%) to disappear even for +2°C global warming. For March, both observational records suggest a loss of 15% to 20% of Arctic sea ice area for 1.5°C to 2°C global warming.